Ross Garnaut - Economic Adviser to the Hawke/Keating Governments and well respected economist has recently published a book that labels Australia as complacent and at the 'cross-road' to its future. "Here is a brilliant guide to the future of the Australian economy that our prime minister, his cabinet and indeed all members of parliament should study. We cannot be sure that big problems are ahead for Australia owing to the end of the China boom, but it is highly likely, and our government must be prepared." Max Corden on the book. Here is an article extracted from the media recently that outlines some of the aspects of the book that we believe is worth a read. It's price is $19.99 from bookshops or can be downloaded in electronic version for $9.99. Australia is enjoying its 22nd year of economic growth without recession – an experience that is unprecedented in any other developed country. For the first decade of expansion, growth was based on extraordinary increases in productivity, attributable to productivity-raising reforms from 1983. In the early years of this century, reform and productivity growth slowed sharply and then stopped. For a few years, increases in incomes and expansion of output came from a housing and consumption boom, funded by wholesale borrowing overseas by the commercial banks. Unlike other English-speaking countries and Spain, Australia avoided recession with the end of the housing and consumption boom (earlier in Australia than elsewhere). This was largely the result of a China resources boom. The boom emerged when the exceptional metals and energy intensity of Chinese growth in response to Keynesian expansion through the Asian financial crisis, and again in response to the global financial crisis, took markets by surprise, and lifted prices of iron ore and coal continuously and immensely from 2003 until the Great Crash late in the September quarter of 2008. China’s fiscal and monetary expansion put iron ore and coal prices back on a strongly rising trajectory in the second half of 2009, and new heights were reached in 2010 and 2011. The high prices for coal and iron ore flowed quickly into state and especially Commonwealth government revenue and was mostly spent as it was received – raising the Australian real exchange rate to unusual, and by 2013, unprecedented levels. The high commodity prices induced unheard-of high levels of resources investment after the recovery of the Chinese economy from the Great Crash of 2008, adding to the expansionary and cost-increasing impacts. The China resources boom created salad days of economic policy, in which incomes could grow even more rapidly than community expectations. The expansionary effect of the resources boom – taking expenditure induced by high terms of trade, resource investment and resource production together – reached its peak in the September quarter of 2011, when the terms of trade began a decline that continues today. The terms of trade fell partly because Chinese growth fell by about one-quarter within a new model of economic growth. A bigger influence was the new model of growth, which caused energy and metals and especially thermal coal to be used less intensively. Huge increases in coal and iron ore supplies are also putting downward pressure on prices and will be increasingly important in future. The declining impact of the China resources boom ushered in the dog days of economic policy from late 2011, when government revenue and private incomes growth sagged well below expectations and employment grew less rapidly than adult population. The maintenance of high employment and reasonable output growth without external payments problems requires the restoration of investment and output in trade-exposed industries beyond resources. And yet the real exchange rate by early 2013 was at levels that rendered uncompetitive virtually all internationally traded economic activity outside the great mines. A substantial reduction in Australian cost levels relative to other countries is required – a large depreciation of the real exchange rate – to maintain employment and economic growth. The more that productivity growth can be increased the better. Helpful policy measures include the removal of artificial sources of economic distance between Australia and its rapidly growing Asian neighbours to allow larger gains from trade – removal of remaining protection and industry assistance at the border as the real exchange rate falls, and investment in transport and communications infrastructure. While China’s new model of economic growth ends the extraordinary growth of export opportunities for iron ore and coal that characterised the first 11 years of this century, new patterns of growth in China and elsewhere in Asia are rapidly expanding opportunities in other industries in which Australia has comparative advantage – education, tourism and other services, high-quality foodstuffs, specialised manufactures based on innovation. But in contrast to iron ore, coal and natural gas, Australia does not have overwhelming natural advantages over other suppliers of these products. It must compete with the rest of world on price and quality, especially with developed country suppliers with hugely depreciated real exchange rates following the Great Crash. Even with the return of productivity growth to the world-beating levels of the 1990s, maintenance of output and employment growth would require a large reduction in the nominal value of the dollar, accompanied by income restraint to convert this into a real currency depreciation. A new economic reform era is required. That requires social cohesion around acceptance that all elements in society must share in restraint as well as commitment to productivity-raising structural change. Achievement of this outcome is blocked by changes in the political culture of Australia since the reform era. Now, uninhibited pursuit of private interests has become much more important in policy discussion and influence. The new Australian government will succeed in building the political culture that is necessary to deal with the problem only if it is effective in persuading the community of the importance of reform, and in confronting the Australian complacency of the early 21st Century. This will be hard, as the government will have to change the 21st-century tendency for private interests to outweigh the public interest in policy discussion and choice. Harder still, it will have to disappoint its strongest supporters along the way to leading Australia into a new reform era. Ross Garnaut is vice-chancellor’s fellow and professorial fellow in economics at the University of Melbourne. This article is based on his book, Dog Days: Australia After the Boom, and is part of a series from East Asia Forum (www.eastasiaforum.org) in the Crawford School of Public Policy at the Australian National University. The most important influence on the Australian economy is arguably China, given our vast exports to China. The Chinese authorities have successfully cooled the economy down, without trashing it as can be seen by the following charts. David Murray, the former CEO of the Commonwealth Bank and former head of the Future Fund spoke recently to the 7.30 Report. He spoke about the current path of the Australian economy and whether it is sustainable. This is the seventh consecutive month that the Index has been below 100. Apart from the 2008/09 period when the Index held below 100 for 16 consecutive months this represents the longest run of consecutive ‘sub 100’ prints since the early 1990s. Furthermore, there have only been two months in the last 15 when the Index has printed above 100. The consumer is clearly stuck in an extended ‘cautiously pessimistic’ phase. In September last year the Index printed 96.9 so it has only increased by 1.3% over the whole year. That is despite 1.25% of rate cuts from the Reserve Bank; a more or less steady unemployment rate which is close to full employment; and some recent positive news around the threatening European situation. This does not bode well for consumer spending and is consistent with the slowdown in consumer spending indicated by the June quarter national accounts. Although this followed a strong March quarter rise, the softening has come despite major policy boosts to household incomes including $1.9bn in fiscal handouts. 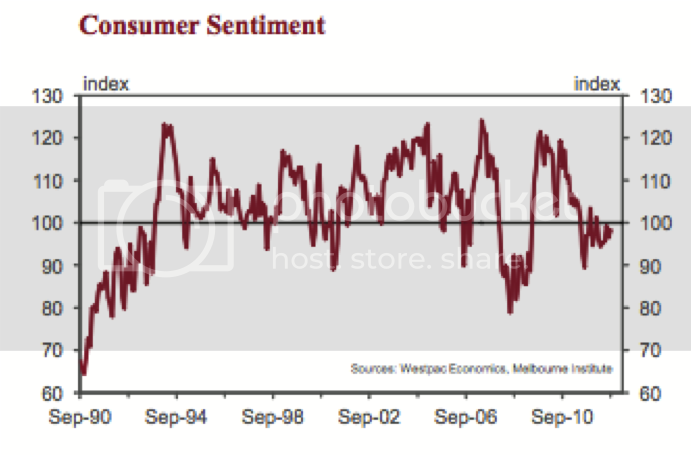 With a sharp fall in July retail sales confirming this boost is now reversing, underlying momentum appears to be soft, in line with the consistently downbeat signal from the Consumer Sentiment Index. Media coverage is often a major factor shaping respondents’ confidence including how they assess their own financial position and how they evaluate macro issues. In the September report we receive an update on the news items which are capturing the attention of consumers and whether these were favourable or unfavourable. It shows the dominant news in September was around ‘economic conditions’ with 47% recalling news on this issue. Next was ‘budget and taxation’ (39.8% recall); international conditions (25.5% recall); and employment/wages (20.6% recall). Other topics registering lower recall include covered interest rates; inflation; politics and the Australian dollar. Since June, the overall sentiment Index has increased by a modest 2.7%. Respondents generally recalled slightly less unfavourable news on international conditions although these items were still overwhelmingly negative. Other news was viewed as even more unfavourable than in June. Four of the five components of the Index increased with the sub- indexes tracking views on “family finances compared to a year ago” up 0.3%; “family finances over the next 12 months” up 4.8%; “economic conditions over the next 12 months” up 0.6% and “economic conditions over the next 5 years” up 3.4%. The sub- index tracking views on “whether it is a good time to buy a major household item” fell by 0.4%. By June this year we were particularly concerned by readings on “family finances over the next 12 months” which was printing at a level around the low-point of the 2008-09 period. Since thenwe have seen an encouraging improvement in this component which has increased by 11.4%. However it is still at a historically low level. For example the average print of that component during that 2008/09 period when the Index registered 16 consecutive months below 100 was 105.2 – today’s print of 96.2 is still well below that average. We can only conclude that respondents remain concerned about their finances despite the recent rally. in June to 39.0% in September. That proportion is the highest proportion since December 1974 and comfortably exceeds the peak proportion during the 2008/09 period of 36.9%. For this survey the 6.4ppt increase in preference for bank deposits was at the expense of real estate which fell from 25.0% in June to 19.8% in September. The proportion of respondents favouring shares stayed near record lows at 5.5%, while the proportion opting for ‘pay down debt’ was steady at 20.4%. If we compare the total proportion of respondents who prefer conservative savings options, covered by bank and other forms of deposits in conjunction with “pay down debt” the current proportion registers 63.5% of respondents. That compares with 64.2% in December 2008 when we were at the height of risk aversion during the Global Financial Crisis. In short, respondents are exhibiting a similar level of risk aversion in terms of their savings preferences as we saw in 2008.
state levels is tightening. Both consumer and business confidence are soft. From a domestic perspective only the fall in the unemployment rate and the ongoing surge in mining investment counter the case for lower rates. However, the fall in the unemployment rate has been due to discouraged workers leaving the workforce while the medium term outlook for the mining investment has recently been revised down by some mining companies. In short, we think the case for lower rates has already been made and there must be a reasonable chance that the Bank will decide to move in October. However, central banks are conservative so a November ‘call’ for the first move looks to be more prudent. Westpac Institutional Bank is a division of Westpac Banking Corporation ABN 33 007 457 141 AFSL 233714 (‘Westpac’). This document is provided to you solely for your own use and in your capacity as a wholesale client of Westpac. The information contained in this communication does not constitute an offer, or a solicitation of an offer, to subscribe for or purchase any securities or other financial instrument; does not constitute an offer, inducement or solicitation to enter a legally binding contract. The information is general and preliminary market information only and while Westpac has made every effort to ensure that information is free from error, Westpac does not warrant the accuracy, adequacy or completeness of the Information. The information may contain material provided directly by third parties and while such material is published with necessary permission, Westpac accepts no responsibility for the accuracy or completeness of any such material. Although we have made every effort to ensure the information is from error, Westpac does not warrant the accuracy, adequacy or completeness of the information, or otherwise endorse it in any way. Except where contrary to law, Westpac intends by this notice to exclude liability for the information. The information is subject to change without notice and Westpac is under no obligation to update the information or correct any inaccuracy which may become apparent at a later date. Past performance is not a reliable indicator of future performance. The forecasts given in this document are predictive in character. Whilst every effort has been taken to ensure that the assumptions on which the forecasts are based are reasonable, the forecasts may be affected by incorrect assumptions or by known or unknown risks and uncertainties. The ultimate outcomes may differ substantially from these forecasts. This communication does not constitute a personal recommendation to any individual investor. In preparing the information, Westpac has not taken into consideration the financial situation, investment objectives or particular needs of any particular investor and recommends that investors seek independent advice before acting on the information. Certain types of transactions, including those involving futures, options and high yield securities give rise to substantial risk and are not suitable for all investors. Except where contrary to law, Westpac intends by this notice to exclude liability for the information. The information is subject to change without notice. A product disclosure statement (“PDS”) may be available for the products referred to in this document. A copy of the relevant PDS and a copy of Westpac’s Financial Services Guide can be obtained by visiting www.westpac.com.au/ disclosure-documents. You should obtain and consider the relevant PDS before deciding whether to acquire, continue to hold or dispose of the applicable products referred to in this document. This document is being distributed by Westpac Banking Corporation London Branch and Westpac Europe Limited only to and is directed at a) persons who have professional experience in matters relating to investments falling within Article 19(1) of the Financial Services Act 2000 (Financial Promotion) Order 2005 or (b) high net worth entities, and other persons to whom it may otherwise be lawfully be communicated, falling within Article 49(1) of the Order (all such persons together being referred to as “relevant persons”). The investments to which this document relates are only available to and any invitation, offer or agreement to subscribe, purchase or otherwise acquire such investments will be engaged in only with, relevant persons. Any person who is not a relevant person should not act or rely upon this document or any of its contents. In the same way, the information contained in this document is intended for “eligible counterparties” and “professional clients” as defined by the rules of the Financial Services Authority and is not intended for “retail clients”. With this in mind, Westpac expressly prohibits you from passing on this document to any third party. In particular this presentation and any copy of it may not be taken, transmitted or distributed, directly or indirectly into the United States and any other restricted jurisdiction. Is the mining boom over and would it be so bad if it is? The mining investment boom still has another year or two to go but its peak is starting to come into sight and the best has probably been seen in terms of commodity prices. While there is the risk of a timing mismatch around the end of the investment boom in 2014 and as other sectors take over in driving Australian economic growth, the eventual end of the mining investment boom should lead to more balanced Australian growth. The eventual slowing of the mining boom should mean lower interest and term deposit rates, the best is over for the Australian dollar (A$) and a more balanced share market. Recent weeks has seen much debate and consternation in Australia as to whether the mining boom that has supposedly propelled the economy for the last decade is over. This followed the cancellation or delay of various resource investment projects including the massive Olympic Dam expansion and a fall in commodity prices over the last year. But is it really over? And would it really be the disaster for Australia that many fear? After all, we have had years of hearing about the two-speed economy where the less resource-rich south eastern states were being left behind and it was said that the people of western Sydney were paying the price (via higher-than-otherwise interest rates and job losses) for the boom in Western Australia, so many Australians might be forgiven for thinking good riddance. Much of the debate about whether the mining boom is over has been characterised by confusion as to what is being referred to with some focusing on commodity prices, others on mining investment projects and others saying that technically it hasn’t even begun until mining and energy exports pick up. In broad terms the mining boom that has gripped Australia for the last decade likely has three stages. Australia last decade as it seemingly benefited everyone. Resource companies got paid more for what they produced, their profits surged, they employed more people, and they paid more taxes, which led to budget surpluses and allowed annual tax cuts. They paid more dividends and their share prices went up. The A$ rose but not to levels that caused huge problems for the rest of the economy. So, not only did the resources companies benefit but there was a big trickle down effect to almost everyone else. As a result the economy performed very strongly and unemployment fell below 4%. The second stage, or Mining Boom II (MB II), has been characterised by a surge in mining and energy investment. This has been underway for the last few years and will take mining investment from around 4% of gross domestic product (GDP) in 2010 up to around 9% in 2013, contributing around 2 percentage points to GDP growth in each of 2011-12 and 2012-13. Firstly, the pattern for raw material prices over the past century or so has seen roughly a 10-year secular or long-term upswing followed by a 10- to 20-year secular bear market, which can sometimes just be a move to the side. The upswing is normally driven by a surge in global demand for commodities after a period of mining underinvestment. The downswings come when the pace of demand slows but the supply of commodities picks up in lagged response to the price upswing. After a 12-year bull run since 2000 this pattern would suggest that the commodity price boom may be at or near its end. Global growth appears to have entered a constrained patch. Excessive debt levels in the US, Europe and Japan have constrained growth, while potential growth in China, India and Brazil looks like being 1 or 2 percentage points lower than was the case before the global financial crisis. This means slower growth in commodity demand going forward. The supply of raw materials is likely to surge in the decade ahead in response to increased investment. Finally, the surge in commodity prices since 2000 was given a lift by a downtrend in the US dollar from 2002 as commodity prices are mostly priced in US dollars. This has now likely largely run its course. Taken together, this would suggest that the best of the commodity price surge since 2000, or MB I, is behind us. There are two qualifi cations though. First, after the recent short-term cyclical slump there will still be a rebound, probably into next year as global growth picks up a bit. Second, it’s way too premature to say that the surge in demand in the emerging world is over - China and India are still very poor countries with per capita income of just US$8,400 and US$3,700 respectively compared to US$40,000 in Australia suggesting plenty of catch-up potential ahead and related commodity demand. In terms of MB II, while the cancellation of Olympic Dam and other marginal projects indicates that projects under consideration have peaked, this does not mean the mining investment boom is over. In fact it probably has another one to two years to run. Based on active projects yet to be completed there is a pipeline of around A$270 billion of work yet to be completed. Iron ore related capital spending (on mines and infrastructure) are likely to peak this fi nancial year and coal and liquid natural gas related investment is likely to peak in 2014-15, suggesting a peak in aggregate around 2014. In other words, the boom in mining investment has 18 months or so to run before it peaks and starts to subside back to more normal levels. But what can be said though, is with the cancellation of marginal projects that were in the preliminary stage, the end is coming into sight. Finally, MB III or the pick-up in export volumes flowing from the surge in mining investment in iron ore, coal and liquefied natural gas will start to get underway around 2014-15.
mining investment has not been unambiguously good for the economy and its inevitable end should hopefully see Australia return to a more balanced economy. size of the commodity supply surge over the decade ahead thereby helping avoid a crash in commodity prices. rest of the economy. Housing and non-residential construction, retailing, manufacturing and tourism have all suffered under the weight of higher-than-otherwise interest rates and a surge in the A$ to 30-year highs. What’s more the boom in mining investment has meant that the Federal Government has not seen the tax revenue surge it got last decade, so last decade’s regular tax cuts have not been possible and this has weighed on household income. This is all evident in the Australian share market which has underperformed global shares since late 2009, with the resource sector being the worst performer over the last year as resource sector profits have fallen 15% or so. So, the end of the mining investment boom, to the extent that it takes pressure off interest rates and the A$, should enable the parts of the economy that have been under the screw for the last few years to rebound, leading to more balanced growth. This is also likely to be augmented by a pick-up in resource export volumes equal to around 1% of GDP from around 2014-15 according to the Bureau of Resource and Energy Economics. Of course a risk is of a timing mismatch around 2014 as investment slows down with other sectors taking a while to pick up. To guard against this the Reserve Bank will clearly need to stand ready to respond with lower interest rates. The bottom line is that the end of the mining investment boom in a year or two won’t necessarily be bad for the Australian economy and will likely see a return to more balanced growth. It’s premature to call the end of the mining boom just yet. The peak in mining investment probably won’t be seen until 2014 and thereafter actual mining production and hence exports will start to pick up. However, the best has probably been seen in terms of commodity price gains and the end of the investment boom is starting to come into sight. While there may be the risk of slower growth as the Australian economy shifts gears away from mining investment in 2014 to mining exports, construction and other parts of the economy that have been subdued, the end of the investment boom should lead to a more balanced economy reflecting less pressure on the interest rates and the A$. Ongoing pressure for lower interest rates as the risk of an overheating economy subsides. This means that term deposit rates are likely to fall further in the years ahead. The best has likely been seen for the A$, implying less need to hedge global shares back to Australian dollars. Resources shares are currently cheap and should experience a cyclical rebound when confidence in global growth improves. However, beyond a short-term bounce it’s likely that the cooling of the mining boom will allow a return to a more balanced share market with domestic cyclicals likely to perform better. The 1st July 2011 marks a significant change in the formation of the Senate in Australian politics. The balance of power in this house of Government now shifts to the Greens. Leading Australian businessmen have voiced their concerns that the current Government is anti-business and that they are being dictated to by minority parties (including the Greens). This sentiment is best captured by John Symonds, the founder of Aussie Home Loans who recently said “We’ve got a Government in limbo, dictated to by minor factions”. Gerry Harvey from Harvey Norman called for a fresh election suggesting that the current state of the Government is contributing to poor consumer sentiment. Usually investors do not have to concern themselves over politics, however given the circumstances Australia now finds itself in politically, we argue that investors must pay attention to this issue as it has the potential to influence investment outcomes. Given that the Greens now arguably have greater influence over Federal politics, we thought it appropriate to examine some of what they stand for. We have produced a table that outlines 10 of the Greens policy ideas, and included some of the risks to the Australian economy that each policy idea represents. Limit Australian Banks ability to move interest rates for housing loans so that they can only move in line with official Reserve Bank rate movements (bill presented to parliament last year, supported by some of the Independants) During times when Banks have to pay more to buy funds to lend out to consumers like we have recently seen, would lead to housing lending becoming unattractive for banks. This could lead to banks making less credit available for the housing sector, which in turn would most probably lead to severe stress in housing prices (but at least this would achieve one of the other policy agendas for the Greens which is affordable housing). Consumer spending is also heavily influenced by state of the housing market. Likely to provide disincentive for small business to hire staff. Small business employ the majority of the workforce in Australia. This could contribute to heightening unemployment in Australia. Use of contractors is widely used in construction industry. Employees rather than contractors makes a workforce less flexible, and arguably more expensive for business. Probable result is increase in construction costs for housing, NBN, and other constructions. Seems at odds with the Greens affordable housing idea. Likely to lead to increased industrial action, which could result in businesses opting to run their operations from other countries. Arguably one of the reasons the standard of our political leaders is relatively poor, is that they are poorly paid when compared to leadership positions in the private sector. This could lead to Australia’s top business leaders being enticed away from Australia and Australian business being run by poorer quality management. This in turn could lead to lower returns for investors from Australian companies. Private system is already overstretched. Disincentive for people to invest in assets that grow in value such as shares, property and businesses. Asset values could fall, fewer people start businesses as incentive removed to build assets. One of the benefits of GST is that all those who consume goods or services, pay tax. Even those who operate in the cash economy end up paying tax when they spend money. It has broadened the tax base for Australia and while we are not necessarily supporting an increase in GST, we would question the wisdom of removing this as an option to increase Government revenue in a broad way if required in the future. Could lead to further complexity in the tax system as new taxes are introduced to bolster revenue. Reduces company profits, which reduces shareholder returns (virtually all Australians own shares directly or through their super funds). Peter Costello removed much of the complexity from the superannuation system in 2006. Is this code for increasing taxation on superannuation savings, particularly for those who would be considered as self funded and considered “well off”. It would seem apparent that several of the Greens policy ideas are already influencing the current Government’s policy positions. The Greens until now have not really had to stand up to scrutiny over their policies as they have never been in a real position of power. That has now changed and it is appropriate that the Australian public pays close attention to the effects of what some of the outcomes are likely from what this political party stands for. There is concern that there are many unintended consequences of the policies being promoted by the Greens, that could not only effect investors, but all Australians. The purpose of this article is to put the spotlight on some of these policies so that informed choices can be made for the good of Australia. As One Nation discovered, it was relatively easy to be anti policies of the day, but they did not stand the test of scrutiny when they began to develop policies of their own. We are about to see how the Greens fare now that they are in a position where they too have to develop policies that reach well beyond the environment. This article has been written by Mark Draper, and do not reflect views of the dealer group. Note: Advice contained in this articler is general in nature and does not consider your personal situation or needs. Please do not act on this advice until its appropriateness has been determined by a qualified adviser. While the taxation implications of this strategy have been considered, we are not, nor do we purport to be registered tax agents. We strongly recommend you seek detailed tax advice from an appropriately qualified tax agent before proceeding. The information provided is current as at June 2011.